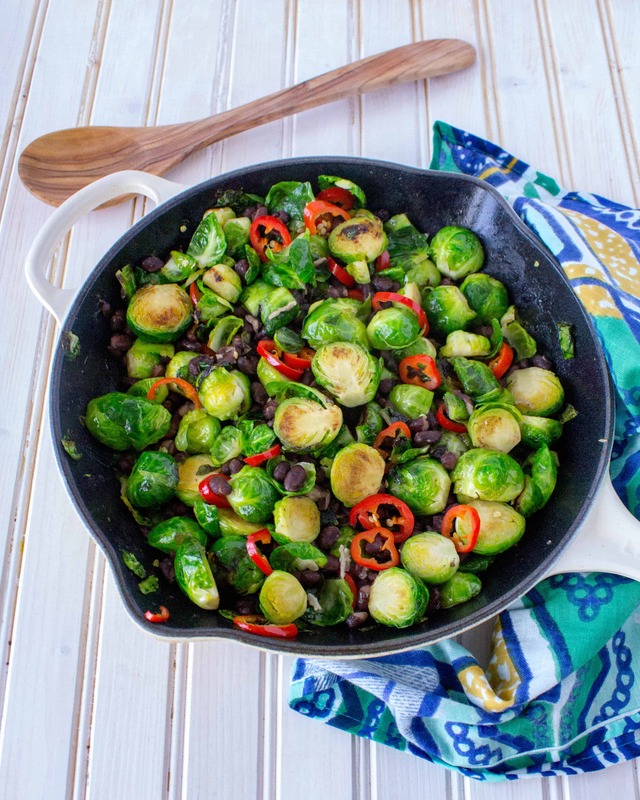 I was initially inspired to create this brussels sprouts and fresno chili dish after realizing I need to up my side-dish game. Just one problem…I don’t do “side” portions of brussels sprouts. I just don’t. 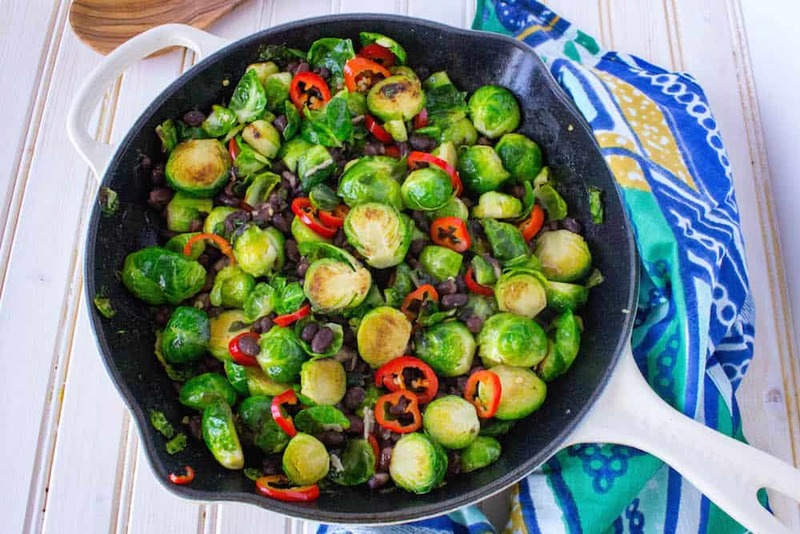 So, here’s my new favorite side entree recipe, featuring the unexpected but delicious combo of brussels sprouts and fresno chiles. Seeing how as on their own, sprouts + chili peppers do not a balanced meal make, I needed to find something else to include in order to justify my cruciferous overconsumption. Enter the mighty black bean. I’ll add a good legume to anything, (salad, soup, smoothie, truffle) so figured, why not here? 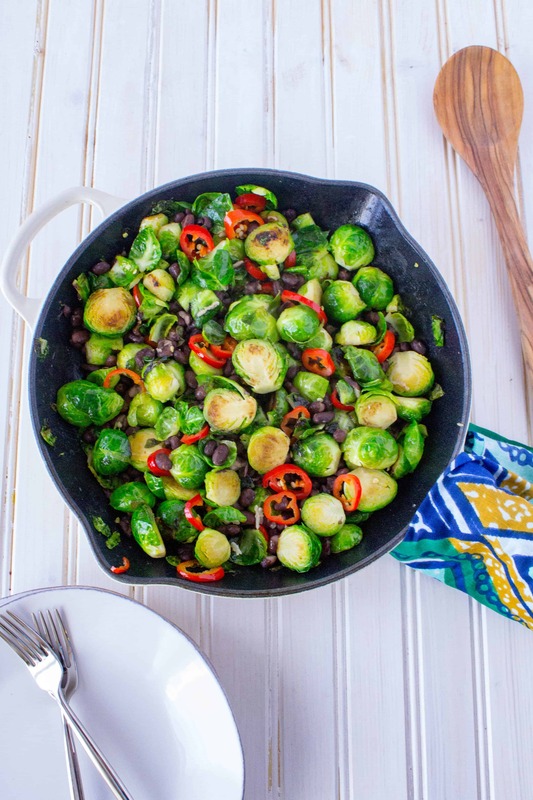 Black beans (along with fresno chiles, lime, garlic, and sea salt) help my beloved brussels sprouts take on a whole new south-of-the-border persona that totally works. A balanced amount of fiber, complex carbohydrates, plant-based protein, and fats. Capsaicin, a spicy phytochemical found in chili peppers that can (modestly) increase metabolic rate, function as an anti-inflammatory, and offer benefits for diabetes and certain cancers. Antioxidants (like beta-carotene and vitamin E) that help clean up damage on the cellular level. 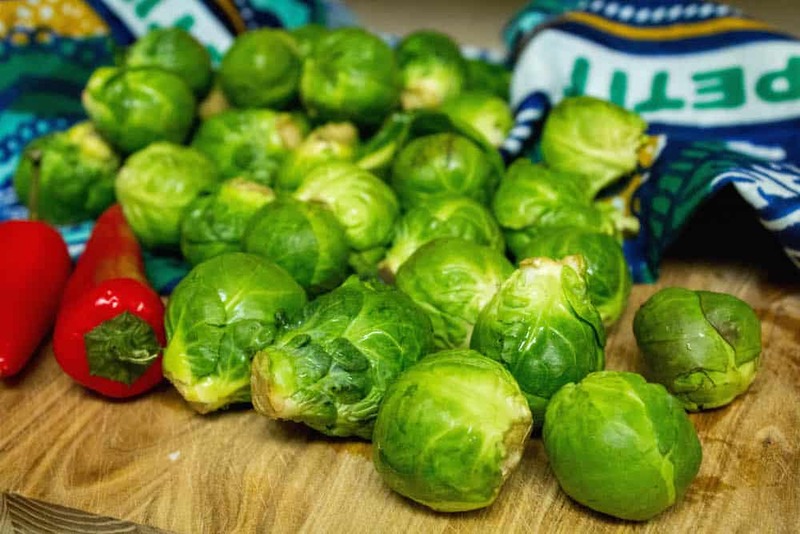 Fiber (aiding in digestion, satiety, and detoxification) from beans and brussels sprouts. A side dish so good that you may decide to double up the portion and call it lunch. Of course, you don’t need to eat this dish the way I do. (In a large bowl usually used for mixing while wearing yoga pants, in case you’re wondering.) You could also try it alongside baked tofu or with tacos or (tortilla!) soup. Just beware that this side dish might just be too good to warrant any other competition. 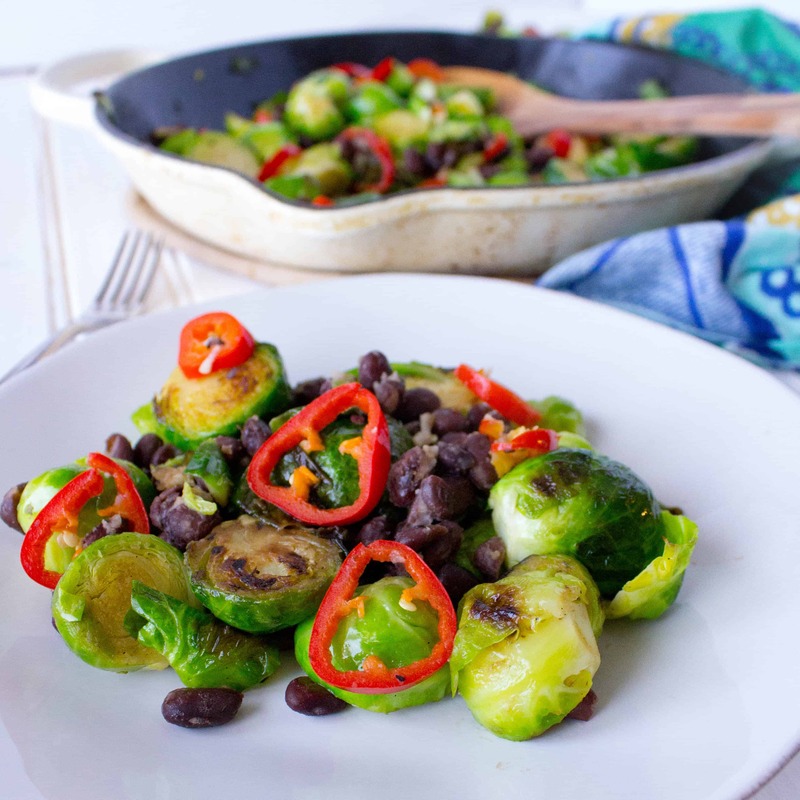 Brussels sprouts and fresno chili peppers are sautéed with black beans, lime, and garlic to create a balanced side or light entree. Heat skillet over medium-high heat. 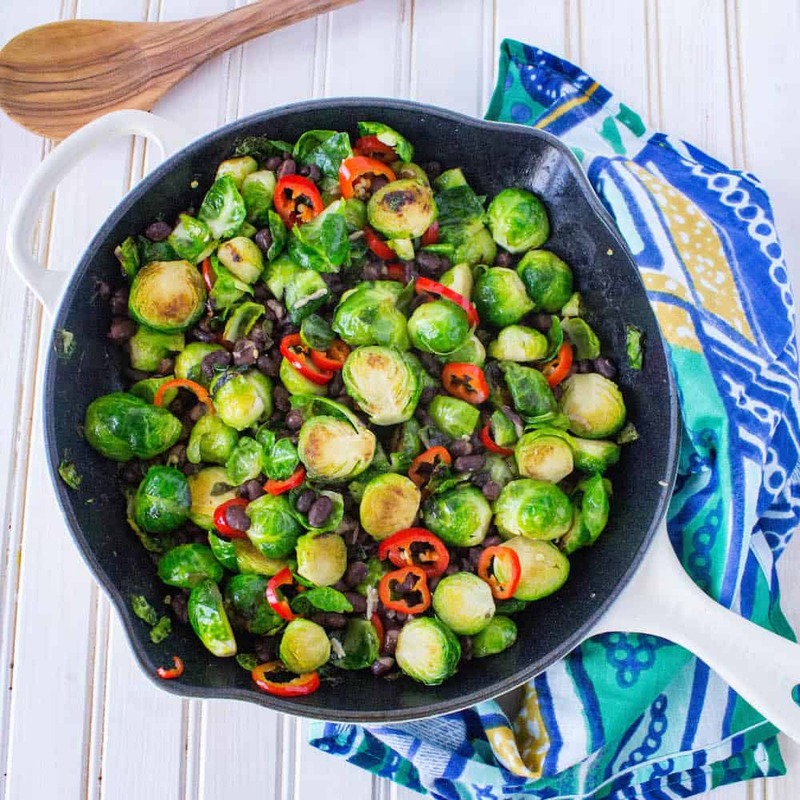 Toss brussels sprouts with oil and salt and add to skillet. Cook until tender, 6-8 minutes. Add remaining ingredients and cook until warmed through, another 2-3 minutes before serving. Haha I do love cold brussels sprouts and garlic is always a necessity. ? Have a great weekend Rebecca! My favorite way to cook Brussels sprouts is with bacon and onions. I start by pan frying 3 slices of bacon (or more if I feel the need) until crisp. I remove bacon and all but 1 TBS fat then add sliced onion until some browning starts, the remove onions. Add more bacon fat, fry cleaned and halved B sprouts cut side down until “sunkissed”(2-3 mins) then I add onions and 2TBS water and lid to steam for 5-6 mins. Season to taste and serve with crumbled bacon. This was perfect, I had the Brussel sprouts and the black beans. I added some cumin and celery.